Every year as a child when Thanksgiving was over I would always get so excited. Of course some of it was Santa, gifts and being out of school, but my sweetest memories are from all the candy and cookies my mom and grandmother would make the whole month of December. I had already decided that this year I would start a cookie making tradition with Aubrey on Christmas eve complete with new pj's and cookie cutters, but this post is about another cookie party that is just as sweet. The best ideas can come from some of the most random places. 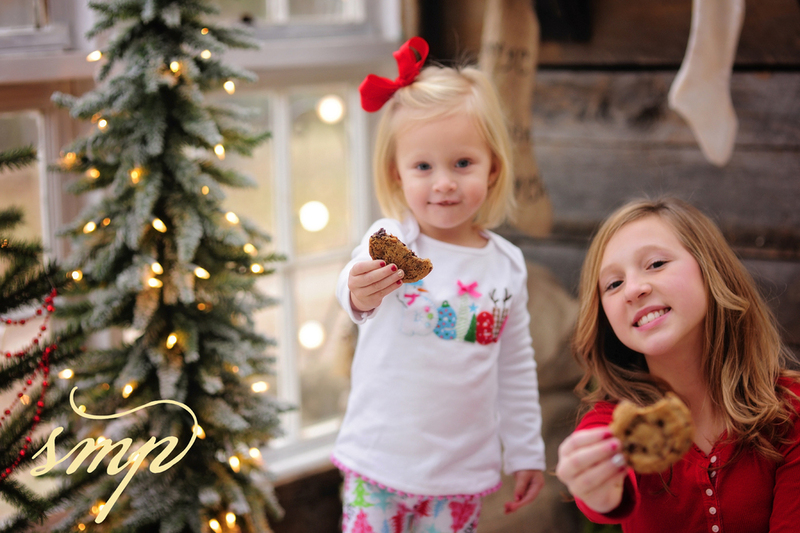 I was shooting a quick Christmas picture for these beautiful little girls, and while editing them my mind ran wild seeing this whole set up of having a milk and cookie party. I immediately called their mom and pitched the idea for them to come back for this set I had built in my head. As a Nashville food photographer, I had some extra Christie Cookies laying around from the recent catalogue shoot, and the perfect milk jug that my amazing food stylist Teresa Blackburn had let me borrow. Now all I needed was for the 2 year old and the 1 year old to cooperate and we would be golden. As you will see they did picture perfect. There were lots of chocolate smears to be wiped and before it was over a really big puddle of milk to be cleaned up, but it could not have turned out any better. I hope you and your family have a wonderful holiday season and enjoy some milk and cookies with your loved ones as well.